“Spectacle” was the perfect name for Sasha Howell’s first fashion centered event. 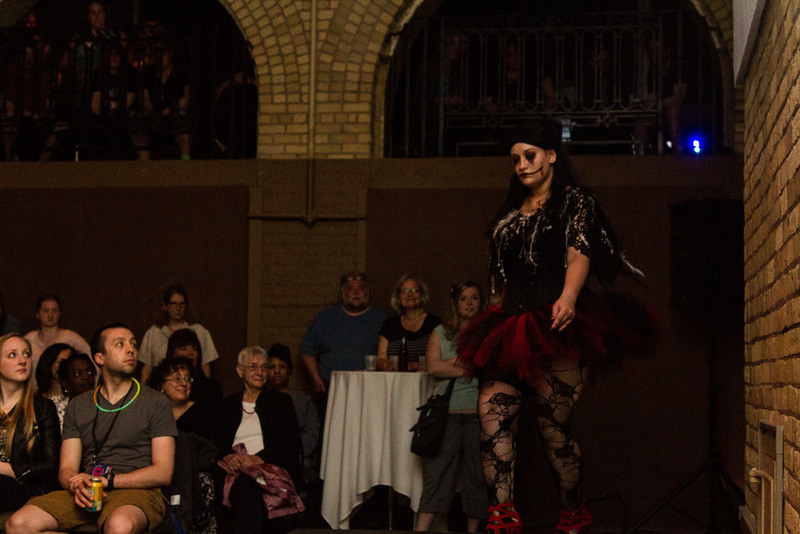 The very first Kickstarter I ever backed, Sasha Howell’s “Spectacle” took place at The Underground on May 23, 2014. Duluth designer Sasha Howell and I after her show. Sasha had a dream of hosting her own fashion show so she asked the community of Duluth (and the rest of the internet) to help. We both knew fashion enthusiasts probably existed in the area, but it just took us a little while to find each other. Models getting ready backstage. Photo by Nickila Photography, as part of Kickstarter donation perk. I have no idea how she managed to put together so many looks in a relatively short amount of time, but I am absolutely amazed. There were five different collections showcased over the course of the evening - Steampunk, Horror, Sasha Style, Burning Man inspired, and Lisa Frank inspired. 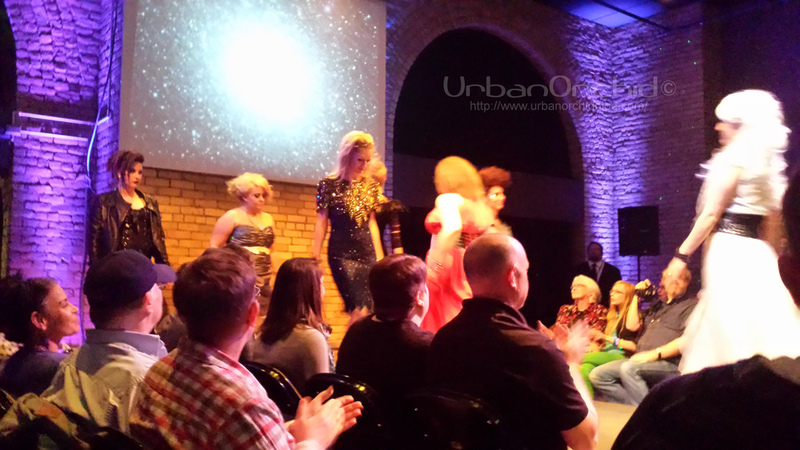 Photo of the runway at the Underground in Duluth, MN. Photo by Nickila Photography, as part of Kickstarter donation perk. Her background as a costume designer (for the Renegade Theater Company and College of St. Scholastica) and with theater showed not only in the detailed garments in each collection, but the choreography. Each look was “performed" down the runway, it wasn’t enough for her to send models down a catwalk. Leather, buckles, brocade, vests all representative of the style. Inspired by the Murder Pretty production studio she is also involved with, the Horror collection featured zombie makeup and did indeed look like something right out of a horror movie. Mirroring her own way of dressing, the Sasha Style collection had some animal print, distressed leggings, and long dresses. It was also Sasha’s dream to attend Burning Man, and when it didn’t work out to attend this year, she put her energy towards making awesome costumes inspired by the festival. Rainbows, unicorns, neon…everything from the Lisa Frank creations I held dear to my heart as a kid, alive on the runway. Taylor Byykkonen. Photo by Nickila Photography, as part of Kickstarter donation perk. The event ended with a drag show, featuring entertainers from the Superior Flame. Here’s hoping a Sasha Howell production becomes a yearly tradition! Written by Urban Orchid On October 23, 2014 In Sasha Howell, Costume, "Duluth", "fashion"
Change can be a good thing. After 14 seasons at the Graves|601 hotel, the Spring 2014 iteration of the glamorous event was held Saturday, April 26, 2014 at the newly renovated Minnesota Orchestra Hall. The sleek staircases and glass in the atrium made for a really dramatic display. Setting up seating on the same level as the catwalk, as opposed to models walking down a raised catwalk, made it feel more intimate and allowed viewers to see a lot more detail in the designs than before. Additionally, general admission viewing from the upper atrium levels provided a unique experience. Event host, Tricia Khutoretsky of Public Functionary, took advantage of the multi-level venue. Even on a rainy and windy evening, the venue was full of fun and fashionable people supporting the Minnesota art and fashion community. During the VIP pre-party, I was able to sample sushi from Social House and spring rolls from Lotus while enjoying a concert by Shiro Dame. This was also the room where the silent/text auction benefitting Public Functionary was set up. Auction items were displayed on tables around the room. Up for auction were a bunch of art and fashion related items, including a delicate looking skull sculpture and a t-shirt/clutch/candle set. Artists were painting models right in the middle of the room. The finished paintings were also up for auction. Auction package I bid on but lost. Came with a candle, MPLS tshirt, and clutch from Parc Boutique. Envision is broken up into two runway shows. Part One featured looks from Idle Child, MAI, Cocoon by Elizabeth Geisler, MartinPatrick3, Velvet Moon, Khampian Vang, and Samantha Rei. My seat was right at the corner so I was able to see details of both the front and the back of each look. Work out wear by MAI. Also check those shoes. I didn’t get a clear shot of one of my favorite items. Photo credit: Nick Kozel. But absolutely every male I know needs this shirt sold at MartinPatrick3. Another of my favorite items was the “Poppy” dress by Samantha Rei. The finale strutted by and the lights came on, allowing time to grab a drink and mingle. After months of stalking following her on Twitter, I introduced myself to Tara Murphy of Neon Esquire. After our conversation, trust me, there are huge things coming for the Minnesota fashion community that extend beyond the Twin Cities and even beyond the state. Be sure to check back here and on her website to stay in the loop. Intermission also gave me time to get to the photo booth set up in front of the red carpet. My friend and I pose for a photo. Photo credit: Michael Johnson. Part Two brought looks from Caroline Hayden, Roe Wolfe, Atmosfere, Tessa Louise, Kjurek, Russell Bourrienne, and Cliche. The music for this half felt louder and more upbeat…it made me want to get up and dance. Loved the structured and polished looks by Caroline Hayden. I wish she could design my work wardrobe! I also realized I love Tessa Louise. These gold pants are amazing. I also loved every piece in this look by Tessa Louise and could wear them all summer long. Cliche’s set made things interesting with light up umbrellas and masks. After the show ended, everyone was invited to the mezzanine floor to dance and mingle. I finally had a chance to peek through the gift bags and was not disappointed. A can of RedBull was the first thing I discovered and I downed it right away so I could continue to enjoy the evening. Also included were coupons galore for the retailers and designer stores that showed, including $100 off at SEE Eyewear, which is great since my glasses are broken. Now, if only I could find my prescription. The gift bags also contained a sketchbook provided by Utrecht and a shot glass from Aviv Vodka. Gift bag contents. Minus the RedBull I drank immediately. Envision Spring 2014 was beautifully executed and continued to get me excited about Minnesota fashion. Now that MSP Fashion Week is back on, I’m starting to plan out how I’m going to spend it - I could definitely work from the Minneapolis branch of my office during the day and go to shows at night! September is still months away but in two weeks, Minnesota will be celebrating a new fashion milestone. Duluth based designer Sasha Howell will be presenting her Kickstarter funded fashion event entitled “Spectacle” on May 23rd. I’ve already got my tickets and can’t wait! For more information on Sasha Howell’s “Spectacle”, please check out the Facebook event: https://www.facebook.com/events/530266843758624/. Envision Fall 2014 is set to be September 19, 2014 so be sure to mark your calendars and check out the Ignite Models website and MNFashion website to stay updated! Written by Urban Orchid On May 10, 2014 In "Duluth", "Envision", "MNFashion", "Minnesota", "fashion"
My last post was a month and a half ago and so much has changed since then. Last month I was feeling stuck - stuck in my childhood home, stuck in Vegas, stuck in an internship that I didn't love. My internship provided a great learning experience and an edge in the industry, but it was no longer exciting to me and I felt my performance start to slip. In addition, changes and stress in my personal life had me itching for something fresh. I made plans to take a trip to visit an old friend in a place I'd never been and quite honestly never saw myself going. Before I left, I submit applications to job opportunities in the area that I saw online, knowing I had nothing to lose. One such opportunity really spoke to me - the firm seemed to have a position available to do exactly what I had studied to do and was looking for someone exactly like me - from my major to my interests, skills, and prior (in)experience. I got a call as I was preparing to go to the airport that they wanted to set up an interview. I went and the interview must have gone well...though I wasn't sure of it when I left. Upon my return to Vegas, I immediately felt like I needed to leave again - I had outgrown my old room and life. Thankfully, I got a call back from the interviewers and after some discussion and deliberating, I accepted an offer to join their team. In the timeframe of about a week and a half, I picked up my life and relocated to snowy Duluth, MN. Yup, somehow it's still snowy in mid-April. The April blizzard that shut down the office early during my first week. Duluth isn't as big or glamorous as Las Vegas or Chicago, but it's charming and even shin deep in snow, I'm excited about this new chapter of my life. I sit here at a coffee shop in the middle of the downtown area watching people pass by not only on the red brick sidewalks, but also through the glassy skywalk system above. The Skywalk is a system of indoor walkways spanning three miles and connects most of the businesses downtown, providing a safe, efficient, and comfortable commute. I had never heard of it until last month but as part of my new job, I will be aiding in the design of an addition to it. Part of the Duluth Skywalk, somewhere downtown. It may seem like it, but I haven't given up on this blog and in fact have plans for going in a new direction. Maybe not entirely new - still planning to post about shopping consciously, fashion, eco brands, and good food - but definitely adding new elements from a new location. At first I lamented the lack of my old favorite chain shops and eateries (no Sephora or Nordstrom or Costco or Chipotle, OMG), but I love that Duluth has so many unique businesses and Minnesota pride. There's a lot more going on here than I originally imagined - from art gallery openings, to up and coming music acts, interesting restaurants, and lots of beer. I know Surly is a Minneapolis based brand, but this was delicious and still means Minnesota is way cooler than I thought. I know Duluth has Fitger's and Canal Park Brewing and others, though. There are still posts I have yet to catch up on, but forgive me - it's been a hectic couple of weeks! Things are starting to slow down so I should soon have time to resume posting. Please feel free to share with me any Duluth/Minnesota based designers and businesses I should check out! I'm sure there are some here, I just don't know how to find them. There's definitely a few things here I'm going to look into but a lot of the action seems to be in Minneapolis and hope to make it down there sometime soon. A lot still changing but every day I'm feeling more and more at home here. This probably won't be my last move, but it's one I should be happy with for some time - the fact that I'm feeling more comfortable instead of more anxious as things settle is great. I'm so ecstatic to have found such an incredible start to my career. Hoping this will be just the change of pace I am looking for and pleased to have an audience to share my journey with. Written by Urban Orchid On April 21, 2013 In "Duluth", "beer", "shopping"